This Tru by Hilton breakfast and beyond post is sponsored. Experiences and thoughts are my own. 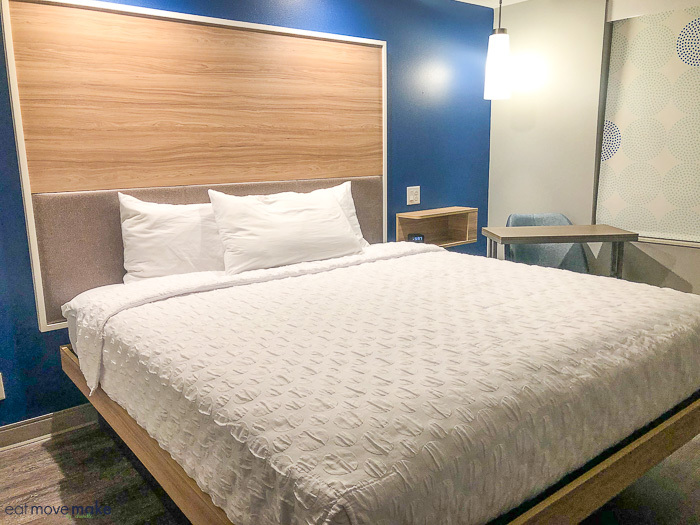 I knew the moment I walked through the front doors and saw the vibrant colors, modern style and tech-forward everything, I was going to love working and chilling at Tru by Hilton. I mean, how cool is this wall mural? Tru by Hilton is a place for the young-at-heart, modern traveler! There’s a 24/7 free coffee, tea and hot chocolate bar with flavored syrups available right when you enter. It’s like they know me! And there are a bunch of cozy little tech-smart work pods scattered around the lobby area built to minimize sound distractions so you can keep your focus where it should be – on work. A hot cuppa joe and a cozy space to work? Tru bliss. Oh, and the guest rooms are really cool too! They’re efficiently designed with loads of standard plugs and USB charging ports – fully equipped for anyone’s tech needs. And there are lots of nooks and crannies to hold devices, luggage and accessories. But what I loved the most about Tru by Hilton was breakfast! The Tru Top It Breakfast Bar brought out my creativity and my inner child. I’ve never had so much fun fueling up first thing in the morning! And it’s FREE. 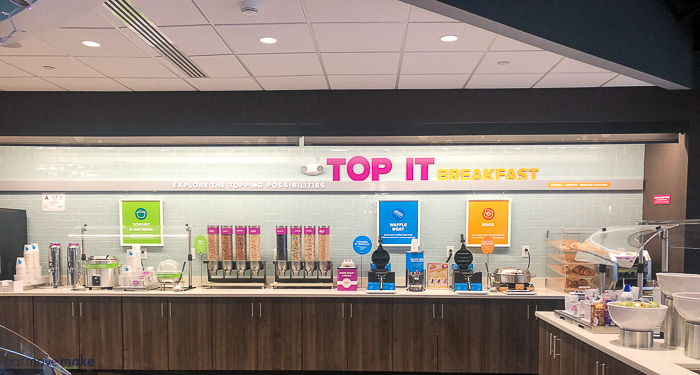 Hot breakfast fans will love the scrambled eggs, chicken sausage, and waffle boats, and everything on the Tru by Hilton breakfast bar is customizable, so start with a base like eggs, oatmeal, yogurt, bagels, donuts or a waffle boat and then top it your way! The topping options feature Kellogg’s cereal faves like Raisin Bran, Froot Loops and Special K along with dozens of other mix and match toppings. I’m telling ya… it’s truly a big kid’s’ breakfast playground of fun and flavor! The first morning, we created a signature Raisin Bran-ana Split, and yes we ate every single bite of this! 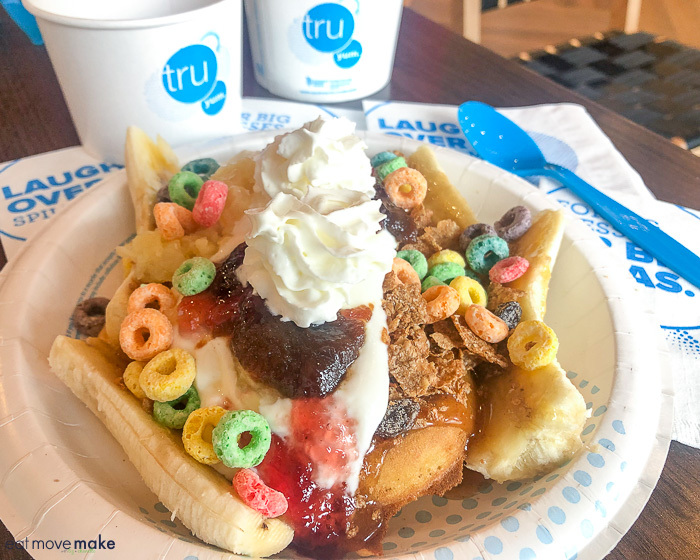 We surrounded a fresh hot waffle boat with banana slices and topped it with Kellogg’s Raisin Bran, caramel sauce, yogurt, pineapple, strawberry jam, Kellogg’s Froot Loops and whipped cream! 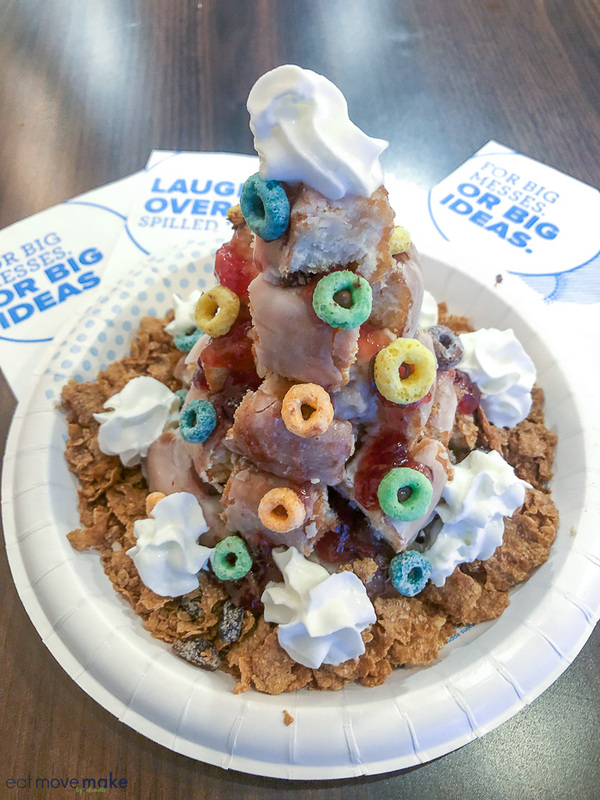 And the next morning we made a Froot Loops breakfast tower using donuts, oatmeal, hazelnut spread, Kellogg’s Raisin Bran, strawberry jam, Kellogg’s Froot Loops and whipped cream. We were going for the look of a croquembouche and I think we nailed it. And then we ate it. We haven’t had such a blast at breakfast in years. The Tru Top It Breakfast Bar inspires fun and creativity! Take a look at my video to watch us construct our delicious cereal bowl creations! 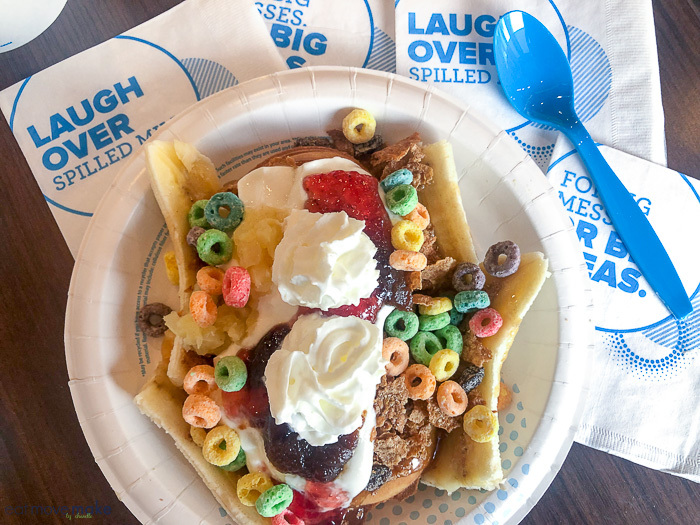 We loved Tru by Hilton’s one-of-a-kind, creative Tru Top It Breakfast. What a perfect way to satisfy morning food cravings! Start by concocting your perfect breakfast, then tuck in and get some work done in the futuristic work pods. Tru by Hilton has it all! Any tech junkie, value-conscious traveler and culinary gourmand will eat it up. I went to a hotel like this for my daughter’s birthday. She got to have a sleepover with friends and we did the continental breakfast. These are my favorite kind of hotels to stay in! I love when there’s a free hot continental breakfast. Yes, makes a big difference! I am a child inside so I would love the Breakfast Bar area too! It’s just awesome and perfect for me. I love playing with flavors and toppings. 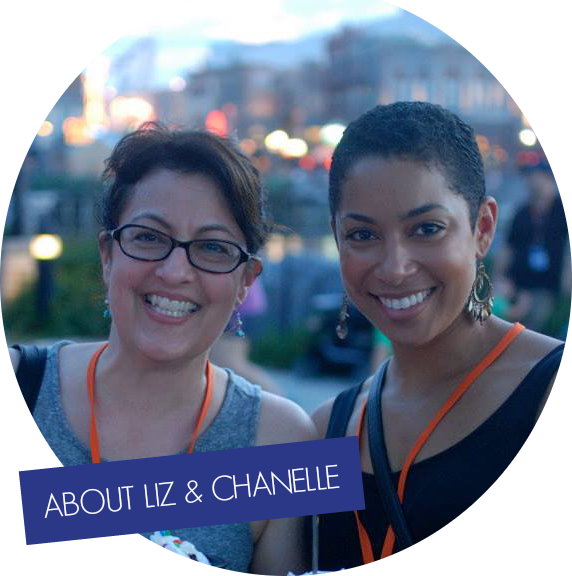 It is SO much fun, and the options were endless – even better! 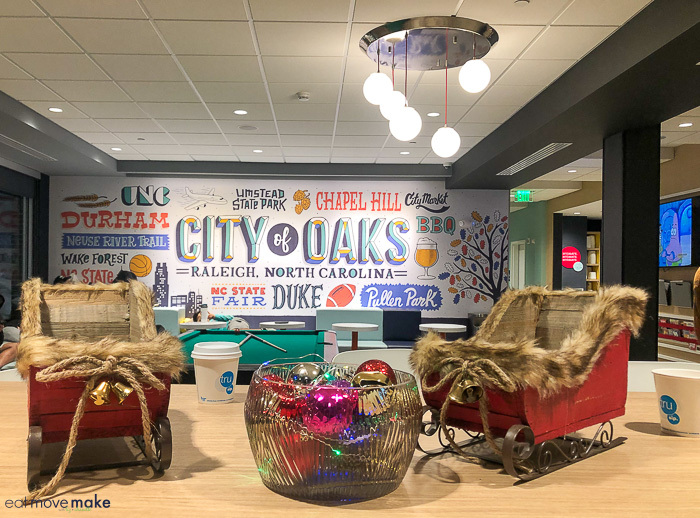 Are those sleighs actual seating? I would love to cozy up in one of those. That breakfast looks amazing! My inner child would love it! Ha! They were decor on a shelf, but if they were life-sized, I would too! And yes, your inner child will love it at the Tru by Hilton breakfast bar! Holy wow!! You sure made some awesome breakfast combos!! I would need that bed after those!! That breakfast looks amazing! If they had an “all day breakfast” thing, I’d love that! The cereal bowl looks so mouth watering. What a way to start the day! Nice to see a hotel keeping up with the times. And that breakfast??? Well, who can top that? Looks good. I’m not sure it’s healthy, but dang yummy! I love the big writing on the wall! Part of getting away is indulging a little bit! I’m a long time Hilton Honors member and I’ve never experienced this! I would stay there 100% of the time if the breakfasts were always like this! Aww yeah. A great breakfast is always a selling point for me when I book a hotel. I want tasty breakfasts on all trips!